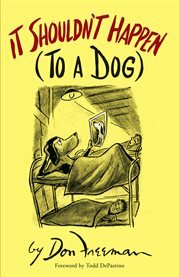 The item It shouldn't happen (to a dog), (ebook) represents a specific, individual, material embodiment of a distinct intellectual or artistic creation found in Charlotte Mecklenburg Library. Army life didn't agree with GI Albert C. Bedlington, Jr. He felt like he was always crawling on all fours, and one day when the very thing he'd feared for months finally happened - he had become a dog! The fellas all recognized him, so he carried on as usual, going on a furlough, visiting the USO, getting in and out of trouble, and serving with the K-9 corps. Recounted chiefly in winsome illustrations, this fantasy was written and drawn by Don Freeman, author of Corduroy and other children's books. His witty and unusual take on World War II-era life among the enlisted men and on the home front was hailed by the Philadelphia Inquirer as a "fantastic and captivating story" and by the Chicago Tribune as "wonderful fun."